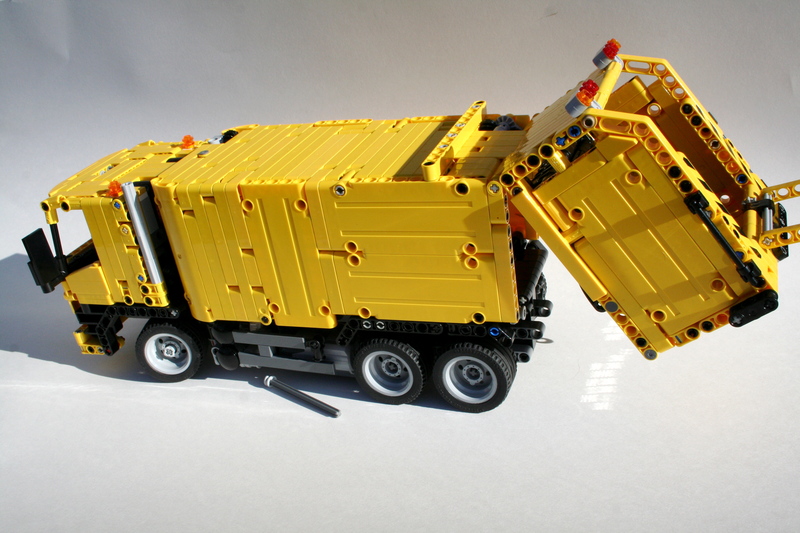 I am a big fan of garbage trucks. 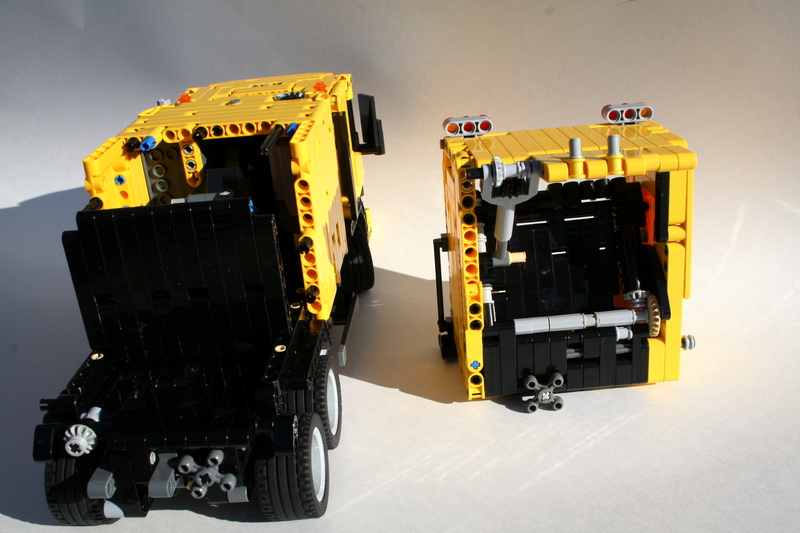 For some reason I find the combination of a smaller truck,with many features all with a complicated compaction device is a great basis for a complicated LEGO Technic model. Plus, trucks are fun. The hardest part was going to be the rear compaction device, so that is where I started. I decided to use a Geesink Norba design as it would give me the largest opening for the trash in the rear because the mechanicals would be on the bottom on and the top of the opening. 13 studs wide is not much space. In addition, this would allow me to have the rear hopper pivot up to let the trash out when it was full. I would need to have three functions going though the pivoting hopper. One at the pivot, and two connecting at the base when the hopper was closed. The dumpster lift would be driven through a knob gear when the hopper was closed on the bottom. The compation device would be operated with a gear on the bottom and a mini linear actuator on the top. This mini linear actuator would also function as the opener for the rear compactor. All the motors would be housed on the bottom, with one motor placed next to thebattery box. The extractor would be operated by another mini linear actuator using a scissors mechanism to move the ejector plate. The chassis was constructed with a PF XL in front of the steering axle. The motor would power both the drive, and the extractor changed by a changeover. The steering motor is placed on the right of the truck. On the left, another PF M motor powers both the dumpster lift and the lower hopper compaction device. All power came from a 8878 rechargeable battery box, through two PF IR receivers, and powered four motors: One XL for drive and the extraction plate, one M for steering, one M for the dumpster lift and lower compaction, and one M for upper extraction and hopper opening. The model worked well, particularly steering and the drive. However the extraction and the hopper opening was a little less reliable. The hopper was too heavy for a single mini linear actuator, and the compaction device was not stiff enough. It happened to get caught on some of the internal edges on the inside of the hopper. The next garbage truck will need to be built a little more sturdy.